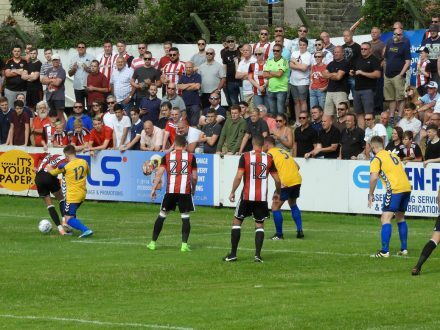 A crowd of 1824 witnessed the opening fixture of Sheffield United’s first team pre-season at a sunny Bracken Moor. 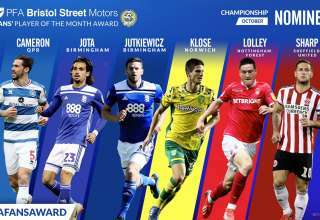 Fans itching for more of the feel good factor that flowed throughout the 2016/2017 season weren’t disappointed as they were rewarded with nine Blades goals in an emphatic win. 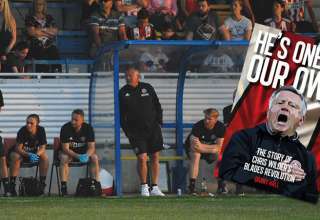 In similar fashion to last years fixture, Chris Wilder opted to get 45 minutes each for 22 different players, choosing to play a first half XI and a second half XI. After the entire ground gave a minutes applause for Bradley Lowery, the hosts got the game under way, with United attacking the terraced end in the first half. 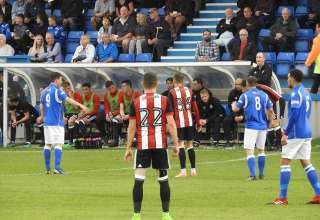 The Blades dictated the early play and the first real chance came when a quick free kick gave Samir Carruthers an opportunity. The midfielder had his angles closed quickly by the Steels’ keeper who managed to block the effort with his body. Wilder had decided to give a debut to youngster Sam Graham in a back three, but the big defender was looking to make his mark at the other end – first heading a corner into the keepers arms, before nodding a Duffy cross over the bar. Duffy was once again involved as he and Carruthers linked up, with Duffy getting a shot away which the keeper spilled, but then smothered with Clarke looking to pounce on the rebound. The keeper impressed shortly after with a great double save, first from the volley of Billy Sharp and then a Leon Clarke effort which he did well to push away. 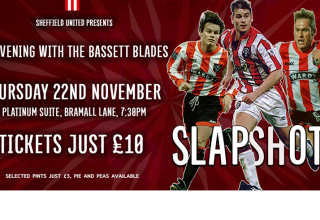 It wasn’t long, however, until the Blades managed to beat the Steels’ stopper… Clarke brought down a lofted ball and teed up SHARP, who hit a first time shot into the top corner, leaving the keeper no chance. 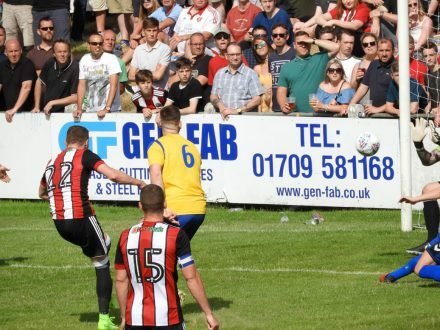 Less than five minutes later, the Blades doubled their lead, CLARKE taking it himself this time around and beating the keeper at the near post. It was to be two in two minutes for the big man, as in a break in which United moved the ball well and attacked in number, CLARKE bagged his second and United’s third. The first half eleven kept coming forward and Duffy came close with an effort saved by the outstretched leg of the keeper, then curling a free kick just wide after Carruthers had been felled attempting a step-over. 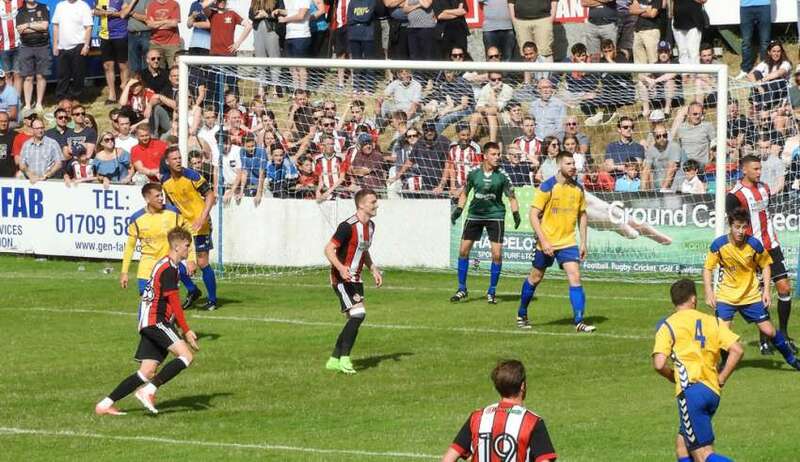 The Blades were to have another couple of corners which came to nothing, before the referee blew the whistle for half time. 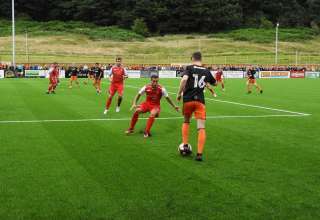 The second half XI took to the pitch and looked to carry on where the other left off, Kieron Freeman saw his long range volley blocked by the body of a defender before the Steels’ keeper somehow kept out an overhead kick from Caolan Lavery. David Brooks, on his return from the Toulon Tournament in which he won Player of the Competition, was looking lively and after beating a couple of men on the left squared to Lavery, who was crowded out. Hanson and Lavery linked up shortly after, with Lavery curling an effort just wide of the far post from 18 yards. The new XI had the goal they sought on 57 minutes, where a great ball down the right wing from Coutts set Brooks scampering towards the goal-line. The impressive youngster cut inside and shot towards goal, forcing a reaction save from the keeper. Unfortunately for the Steels’ stopper, LAVERY was waiting to pounce on the rebound and tucked the ball into the back of the net. Brooks looked confident and eager to show what he could do, with direct running and even a cheeky back-heel in the Stocksbridge area. LAVERY looked to add to his tally with a free kick which sailed just over the bar, before being frustrated by a couple of good saves. He was to have more luck in the 72nd minute when a loose ball put him one-on-one with the keeper – a step over and a calm side foot into the back of the net made it 5-0. 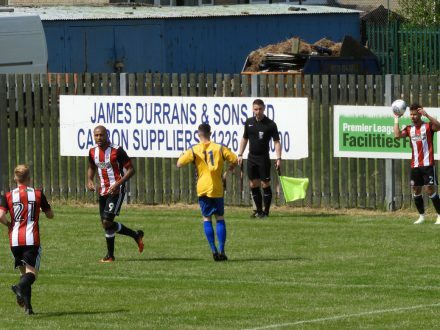 LAVERY was given a golden opportunity to claim his hat-trick ten minutes later, slotting home with a stuttered penalty after Freeman had been fouled in the area. Not content with six, BROOKS beat one man, before dropping a shoulder to send the next the wrong way before placing an effort into the bottom corner from just inside the area. 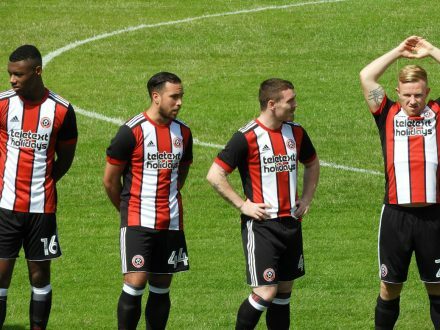 New boy Enda STEVENS was next on the score sheet, making it 8-0 with his first goal in a Blades shirt, towering above a defender at the back post to nod home. There was just time for another talking point from BROOKS who completed the scoring with a nonchalant left footed finish from 18 yards. 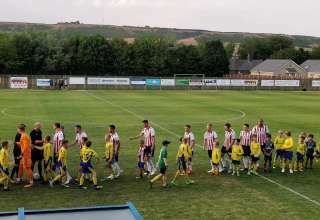 A great return to football for the Blades supporters and whilst no measure of their readiness for the coming season, a very positive result for Wilder’s side. First half XI: Moore, Basham, Graham, O’Connell, Baldock, Carruthers, Fleck, Thomas, Duffy, Sharp (c), Clarke. Second half XI: Eastwood, Freeman, Wilson, Stearman, Lafferty, Coutts (c), Reed, Stevens, Brooks, Lavery, Hanson.